The 1992 Series Press-Set is a resolver-based system designed specifically for harsh pressroom environments. With its "ready-to-serve" menu, the Press-Set reduces setup time and scrap and tooling damage while increasing uptime and improving profits and efficiency. 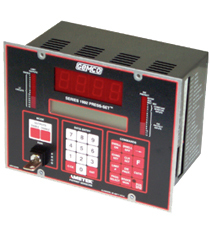 The 1992 Series Automation Controller is designed as a modular system that allows you to select features and options to reach the level of automation your processes require. It includes a 16 channel programmable limit switch and 12 programmable and 3 static die protection inputs. The programming features allow the unit it interfaces with feeders, tonnage monitor, lubricators and part transfer equipment.